"If my fingers are slightly long in relation to length of palm, how can this imply that my palm length is short?" Because, so far, it appears to me that you might consider '7.5 x 8 x 9' then also comparable with the standard fire hand shape... and then why not '7.5 x 8 x 8' as well??? If we look at the numbers specific, then we can see that the finger length vs. palm length ratio is at 75% in a typical fire hand shape according your C.S. guideline. However, if we look at Patti's hands... the ratios are: 7.5/9.6 = 78.1% and 7.6/9.6 = 79.2%, which is for both hands 3% to 4% higher. Now, my more detailed approach shows that a percentage difference of 3% to 4% can easily make the difference whether fingers are 'short', 'medium' of 'long'. And a likewise significant effect is visible for the palm shape: according the C.S. guideline the pb/pl ratio in a fire hand shape is 80%, but these are for Patti's hands: 83.3% (in both hands). Now Lynn, I am wondering... since the C.S. describes no standard for a 'medium hand shape' (nor the other hand shapes)... how can you decide whether a hand is within the range of a fire hand shape by just looking at the proportions? Because a proportional formula for 'medium hand shape' is missing... and I haven't even considered the implications of that the typical fire hand shape proportions is based on a method where palm width is typically measured slightly larger than via the metacarpal approach... which could implicate that the 7.5 x 8.0 x 10 should probably be corrected into 7.5 x 7.8 x 10 (based on my earlier estimate that the difference between both approaches should usually be about 2 mm)... and then it becomes even more notable that Patti's proportions are at a considerable distance from the typical fire hand shape proportions. So Lynn, maybe we can agree here that it would probably be better if you had translated your '7.5 x 8 x 10' fire hand shape formula into '7.5 x 7.8 x 10'... in order to make any further comparisons with my results? Well... I'm also bearing in mind the attributes of character that go along with using the elements. I don't think earthy is the first thing that comes to mind when you meet me. Fire might as I have red hair and rarely sit still too long. I was told in the CS system they would be fire. I took a screen shot of the thumbnails images of some of the scanned hands I have on file from 1999 and 2000 - pre digital camera days. It is interesting to see the variety of shapes. I would guess that 28/29 are air. "Eyeballing" I'd say that 24 is earth, 27 fire and 28/29 air. Mine are closest to 28/29 in appearance (to my eyes) with a little shorter fingers, but not as short as 24 or 27. Indirectly you are now suggesting that doing 'calculations' is only a a part of my 'hand shape profile'-approach - but I would like to point out here that in time you and Johnny became aware that working with (proportional) percentages for finger length vs. palm length is a requirement in order to make an assessment. "... the palm is much longer than it is wide ie it is a rectangular palm"
Lynn, according my view we are confronted here with a key-problem in the C.S. appoach: because these do not present any specific guidelines for discriminating what is called a 'square palm' from a 'rectangle palm'. For, regarding your choice of words, I could even argue here that when I take your words literally... those words could even apply for far most 'earth hands' - simply because for the human hand it is perfectly normal to have palm length exceeding palm width! (I think in more than 99% of all hands the palm length is much longer than it's width", which includes a large majority 'earth hand shape' cases as well...! So far I have the impression that the difference never was defined exactly: not in Dukes' book, not in Fincham's book... and I can also not find a specific clue in your guidelines. Maybe I should have started discussing this key-issue at a much earlier stage in this discussion () . I think the 'eyeballing' approach works for fitting essence to hands and matching the right element to hand shape. Do you find any air hands in the above collection? None of them are my hands. btw, I don't think my hands have changed much over time, if any in regards to shape. Patti wrote: I think the 'eyeballing' approach works for fitting essence to hands and matching the right element to hand shape. Sorry, I had misunderstood your picture completely. (I assumed that they were all hand scans of your ow hands... sorry, the pictures are far too small to notice any further details as they concern the hands of various people - so I decided to withdraw my earlier comment). Martijn, I am still trying to understand all this and haven't studied all the details yet. (1) What did you base your 'pure' hand shape proportions on? In your article you mention that you based your study on 16 hand pictures presented by 4 authors. ie 4 hands of each elemental type. (2) is this enough for an accurate study? These are excellent questions Lynn! 1) The 'pure' hand shape proportions come from the average proportions for each hand shape. 2) Well, regarding the word 'accurate': it is hard to understand exactly what the word 'accurate' here means. However, during the process of sorting things out I have found various clues that the average proportions are not far away from the expected average proportions according this model... basically this is because each of the 4 axes is very close to the 'central axis' in the 4 zones. So, if I would add more examples, I would expect each of the 4 axes to move toward the central axis in the colored zones. This implicates that AFTER adding more examples, I would probably be able to make the model even more accurate... however I have reasons to expect that the numbers in the 'hand shape profile' picture would hardly change at all (because in most cases the proportional differences would probably chance only a few hundreds of a percent - and since I have presented the numbers 'rounded' to tenths of a percentage, therefore some of the numbers would probably not change at all). In the CS system, I think they would be aiir with slightly short fingers but not short enough to be earth. I have air skin texture and air depth/width of lines. Very square looking palms, too square to be fire. I'd more identify with earth/air. By the way Lynn, your words and arguments are getting more and more confusing for me. "I am still not convinced that fl/pb calculation is neccessary unless they have combination hand shape." What do these words exactly mean? Or were you just thinking out loud in response to my ideas? Then, wouldn't it make sense here that the combi fire/water can best be described as: rectangle palm + medium fingers? ... Now Lynn, I know that you have considered Patti's palm shape ratio as well. So, I sort of understand why you associate Patti's hand with 'fire/air' anyway. However, your arguments are rather weak here (and unacceptable in the perspective of my fire/water example). And therefore... since you have no specific criterium available for recognizing a 'square' palm I think Patti's example could actually substantiate my point that measurements and ratio-calculations are actually necessary to understand your assessment! Okay, I will adjust the position of the dots slightly to the left in the earth and water hand. Yes, I agree regarding regarding your general observations about the 4 hands. I consider the 'fire' 'air' hand being by far the worst example in Johnny's photo examples... because the photo is not taken 'frontal'. And for this reason it would probably not make sense to include that example in our discussion. By the way, I do not consider the issue of wrist alignment as problematic - because the center of the upper wrist crease will not leave it's position (this is because that crease relates to the wrist bones). Regarding the closed thumb in the water hand example, yes I agree. We would need to correct for palm breadth, which is probably slightly wider than suggested by the photo. Though I think the correction would only need to be very small. Hmmm... after considering these issues I have to conclude here at this early stage that at least 1 of Johnny's photo examples (the air hand) can not serve as a new point of reference in this discussion. Lynn, and the other element users, mention particular references to ratios in regards to finger length to palm length and palm width, which in turn relates to specific measurements. 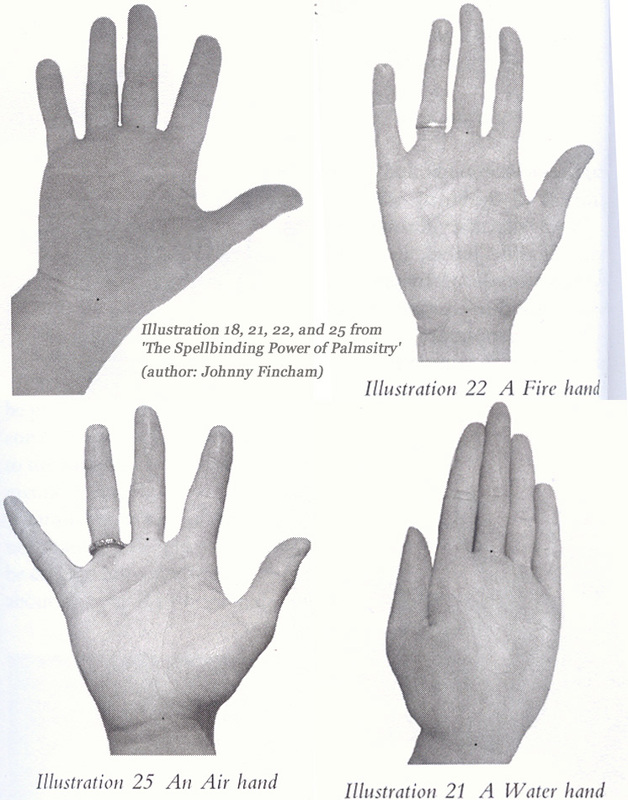 But, I doubt in reality measurements were used when the various authors selected hands to use as examples, but rather the 'obvious' difference in 'appearance' of the four types. Martijn, I think your parameters call for a perfect square and this is not really easily found in nature. Sometimes you will even find what would be called an earth shaped palm where the palm is much wider than it is long and the fingers are average to short. Yet the palm is not square. I see this often on men who are involved in jobs that involve a lot of physical labor - such as road construction. The hands in general are similar in length to the face. So this can imply that the combination of length of palm and length of fingers combined leads to an average of some sort that fits men and women in a common fashion. Therefore, if the palm is long, typically the fingers will 'appear' shorter than average and when the palm is short, the fingers will appear long. It is only the unusual that will stand out (earth - short/wide and water - long/narrow). That is why most hands will likely fall into the mid zone of mixed elements with fire involved using your choice of measurement points. In my opinion, for true accuracy in finding palm shape, there needs to be more points on the palm taken into consideration. For the palms, all four corners need to be considered along with widest and narrowest locations. Patti, in my model the palm width versus palm length ratio do not call for a 'perfect square' at all! For, in my model the 'medium palm' has a pb/pl ratio of only 0.8 (and not the 1.0 as indirectly suggested by your words 'perfect square'). Regarding those short fingers + exceptionally wide palm examples (which are actually quite rare)... I am not sure what you meant to say there, but I am quite sure that both the C.S. approach AND my approach will have the same result for those hands: earth hand shape. Maybe you can present a nice example to make your point more precisely? PS. I fully agree that this is a matter of 'perpectives', and therefore I understand your association with face length. However, it's a tricky activity to compare hand length with face length, because that would force you to consider the hair line as well... which is age-dependend, especially in men. So for me that perspective is simply a 'no-go area' (though I realize that quite a few hand reading authors have used the rather naive guideline that hand size can be assess in the perspective of face length. Beyond the hand itself I would prefer to use body height as a far more realistic and stable alternative instead of face length). PPS. Patti, I think your thoughts about the '4 corners' much more relate to the 'quadrant analysis' - which is not considered as an aspect of hand shape in the elemental approach. Thank you for pointing out that the approach of 'hand shape profile' (based on measurements & ratios) provides the opportunity to take away a large part of the 'subjectivity' ... especially for 'mixed hands', I would add. PS. By the way, I fully understand your request for a system to assess the developments of the palmar mounts... but I guess that should include 'height' of the mounts as well, so I am not sure that an approach based on measurements would serve in that perspective. Maybe the elemental quadrant analysis is an interesting alternative for the planetary mounts approach. But that goes sort of beyond this topic. Martijn, thanks for your replies to my many posts! I will go through them, as I see there are some things I need to clarify / maybe didn't express well. Sorry, there are just not enough hours in a day at the moment to get everything done. Lynn wrote: Martijn, thanks for your replies to my many posts! I will go through them, as I see there are some things I need to clarify / maybe didn't express well. Sorry, there are just not enough hours in a day at the moment to get everything done. That's alright Lynn, take your time... I realize that this (multi-perspective) topic is not easy to be discussed at all. (Looking back, it took me quite a few days before I was able to communicate my ideas and observations clearly). I've taken the time to try your system out on a few obviously unusual hands, water and earth and the system does nicely place them into the categories you've arranged. In that regards it is an excellent system for helping people figure out for themselves their hand shape. Next it would be good to find where the boundaries are in definition or associated behaviors as I think some standards have been moved relative to the CS system with this one. Maybe you can specify the issue regarding the boundaries? (I would prefer to focus first on the definition, associated behavior might later become another interesting perspective for further discussion). In the sense of definition, in particular fire and air dimensions, there is a lot of discrepancy and gray areas in what or where one shape ends and another begins. Most hands will likely fall into this central zone with a slight lean to one section or another of the four areas in the chart. Patti wrote: In the sense of definition, in particular fire and air dimensions, there is a lot of discrepancy and gray areas in what or where one shape ends and another begins. Most hands will likely fall into this central zone with a slight lean to one section or another of the four areas in the chart. Well, in general I would recommend to use the 'hand shape profile' picture... because when using the numbers presented in that picture there are no 'discrepancies' at all. However, I do agree that it could for sure make sense if we would try to find fundamental principles behind those number... in order to adjust those numbers. Because only then the numbers would no longer be the direct result of the hand dimensions that were presented in the books. And then the numbers would for sure make much more sense. So, I really like your idea (if I understood your idea correctly). I asked Christopher Jones about handshapes, (whether we had actual proportions for standard earth/water/air hands). He gave me permission to post this extract from his Foundation Diploma Book. He asks you to please bear in mind that it was written 20yrs ago and intended as a rough guide rather than a precise measurement. From Christopher Jones book, Cheriological Society Foundation Diploma. It can be seen from this last handshape type that the proportional length of the Earth finger relative to the width of the palm is a useful measure for determining secondary handshape types. In the pure Fire handshape type, we have an oblong palm with fingers shorter than the palm and with the Earth finger shorter than the width of the palm. In the Fire-Air hand, we have a Fire shape palm with the Earth finger as long as or longer than the width of the palm (hence the Earth finger is longer). In the FireWater hand, the Earth finger is also the same length as the palm but the palm itself is narrower. again shorter than the width of the palm. Typical proportions for the pure Fire handshape type are with a palm which is 10cm by 8cm with an Earth finger which is 7.5cm long. Hence, the Earth finger is 75% the length of the palm and also just shorter than the width of the palm. In the Fire-Water and the Fire-Earth handshape, the length of the Earth finger proportional to the length of the palm remains the same, but the shape of the palm itself is different. In the Fire-Air hand, the shape of the palm remains the same, but the Earth finger is longer. Water Hand: Narrow oblong palm, Earth finger 85% length of the palm and longer than the width of the palm. Water-Air: 'Wide oblong' or 'narrow square' palm shape, Earth finger 85% length of palm but the same length as the width of the palm. longer) as the width of the palm. same length as the width of the palm. Fire-Earth: Squarer oblong palm, Earth finger 75% length of the palm and shorter than the width of the palm. Interesting to notice that the title is 'Palm Width and Earth Finger Length', which suggest that these two represent a significant combination in the C.S. system - especially in the perspective of making an assessment for 'secondary' (mixed) hand shapes. PS. I see no specific requirement that in earth hand shape the finger length can be no more than 75%. Instead the descriptions suggest that a percentage close to 75% would be just fine (and additionally there is only the requirement which says that finger length is shorter than palm width). So, at first sight I see no major contradictions regarding the results of my model. Yes I already told you that we used middle finger length in the perspective of combinaiton hand shapes. With regard to the 'pure' handshapes, the middle finger vs palm width criteria that Christopher posts here would happen 'by default'. I never used them because it happens automatically. ie it is obvious that in an earth hand with square palm and finger 75% length of palm, that the finger would also be shorter than the width. etc etc. As I told you before, that is a standard earth hand shape - square palm, short fingers (short fingers being 75% of palm length). So anything longer than that would be slightly longer than a standard earth hand (but once it gets to 80% and medium fingers then we are talking combination hand shape). In your model, I think your criteria are different for fire hand shape - don't you have the standard finger length longer than 75%?? But I agree, I haven't noticed any major contradicitons so far - though I still haven't studied the charts in depth. OK, no it's not THAT complicated! Only in pure handshapes, where I don't feel all the calculations are necessary. And in face-to-face readings I don't think anyone would take the time to measure the lengths & work out the percentages. I think for practical purposes the old guildelines of "short or long fingers, square or rectangular palm" serve just fine in face-to-face readings. But as Mooky said "It is fine for you Lynn since you have looked at thousands of hands." re tap's hand. OK 'nonsense' was maybe the wrong word. Confusing for sure! I understand what you are saying about 'it shows that tap's hands are hard to classify' - so in a reading we wouldn't take much notice of her handshape - if it is 'medium', it is not showing a strong elemental bias, so we would move onto the next hand feature. re "Though I would agree if you would have added that 'mixed' code combinations itself are not suitable to be translated into specific personality characteristics." well the list FIRE (+AIR)/WATER (+FIRE) on it's own does not make much sense to me, but you probably could translate it, if I knew which parts of the palm/fingers were fire, air, water. But as I said, I've not translated it via the chart (or looked at tap's measurements) to see if the palm is narrower than standard fire and fingers are longer than standard fire etc - it can all be translated, but a 'triple' element combination is probably not going to tell you much of significance about the person. Just as 'medium' or'average' anything on the hand is not of special interest, I prefer to look at 'what is not average'! PS sorry for several long posts & too many words! I am trying to catch up with this thread and explain my thoughts & answer your questions Martijn. I didn't understand it when I first read it (and I don't understand it again now!) I will go back and read over it again. Patti's is a similar example. I do not accept your banana, because I did not just look at the first 2 measurements! I noticed palm length is shorter than standard fire, but working out fl/pl = 78%. So the fingers are slightly longer than standard fire, but not long enough to be 80% = 'medium', they would still fall within the range of fire. And they are shorter than palm width, which is still under category fire. Now I did notice that palm length is shorter than standard fire palm, and this is why Patti views her palms as square, because they are squarer than fire hand, but they are still rectangular. Now we have the grey area that the CS system does not answer....are they square enough to be 'earth hand'? Going by measurements I can't honestly tell you exactly. But looking at Patti's handshape, it appears to be more rectangular than square. (which is not at all scientific, so I give you permission to go and to celebrate your chart!). So, yep it could be a fire/earth combination as the palm is 'squarer' than standard fire. (But it is not a fire/air combination because the fingers are too short ie less than 80% medium). NB I did ask Christopher, hence my post above from his book. No he did not mention specific measurements, but there are some proportions. (Patti's was 9.6, 9 would be much more questionable, as the palm is squarer and the fingers would be 83% (long) yet the palm would not seem big enough for an air hand. 7.5x8x8 = square palm and fingers 93%. That would be a very small air hand! maybe an air hand on a person who was very short in stature! I need to look at your previous post again, because once more it is the question of "are the fingers long or is the palm short?". In Patti's case it looks like short palm rather than long fingers (looking at fl/pl). Palm shape (pb/pl) - is the palm short or is it a bit wide? Sorry Martijn it is going to take me some time to learn your % and learn how to change the habits of 16 years!! I will read that previous post again. Sorry if I am inconsistent in my approach to CS guidelines - but looking at other authors it seems we each have a slightly different way of doing it, at least you now have Christopher's approach we we were all taught. I have measured quite a few hands across metacarpals and I am surprised that there seems to be very little difference from my method of measuring across centre of palm, I expected centre measurement to be much wider, but maybe because metacarpls are at an angle it is, as you say, only a couple of mm. For the purpose of 'face to face' handreadings, a couple of mm is not of any consequence. re "how can you decide whether a hand is within the range of a fire hand shape by just looking at the proportions" - by the general guidelines, rectangular palm and short fingers!! re proportional formula for 'medium hand shape' - fingers would be 80%. Palm shape is more difficult to say because I am aware that in CS system, when we talk about 'square palm' the palm is still usually longer than it is wide! my guess is pb/pl = 85% in medium hands. Patti wrote: I took a screen shot of the thumbnails images of some of the scanned hands I have on file from 1999 and 2000 - pre digital camera days. It is interesting to see the variety of shapes. I would guess that 28/29 are air. Thanks for all these hands Patti! All shapes and sizes, yes I agree with 28/29 look like air. But some of them I can't tell from thumbnail. This would be an interesting exercise - "assess these handshapes"! but one I don't have time to do at the moment!